10:05 am. July 16, 2018. I’m alone in my office. There’s a soft rain coming down outside the window. We need the rain to cool down the very high temperatures we’ve had for the past two weeks. However it’s a sad rain. 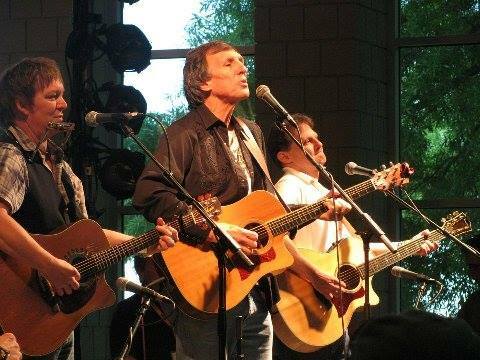 My friend and fellow songwriter, Mickey Clark passed away yesterday from a two-year bout with pancreatic cancer. I’m fighting back tears. Mickey and I first met at the River Roots Festival in Madison in 2010 when it was called the Ohio River Valley Folk Festival. I was to have an opening slot before Mickey. I’d only heard of him through John Walburn but quickly realized Mickey’s songwriting talent after watching him perform Shanty Boat Bill on a YouTube video. What an honor it was to get to open for him. The next day I got a phone call from John Walburn saying that Marty Miller, Mickey’s bass player had a bag of instrument cords that had gotten mixed up and ended up at my house. So Mickey, Marty and Vicki Miller along with Mickey’s wife Sandy came to pick up the bag. They had their guitars with them so a whole group of people including my wife, Andra, John Walburn, Jack and Missy Ulery, Geoff and Kelly Walburn and several other good friends ended up playing music, telling stories and getting to know each other until late in the evening. That picking session became a tradition at our house at least twice a year. We will keep the tradition going but it will never be the same without Mickey. I could go on and on about Mickey’s songs, his accomplishments in the music business and all the famous people he’s met and shared a stage with but that would take a long time. What’s touched me the most is his soul. He made everyone around him feel important. If anyone had a lack of confidence all they had to do was to spend some time with Mickey. It was around 2011 when we had a songwriting session at my house and wrote Bakersfield Wine together. Mickey recorded it on his Reasons And Rhymes album in 2014. I rarely perform our song in public because I don’t think I give it justice compared to Mickey’s version. You can bet I’ll give it my best and sing the song proudly with more feeling now more than ever. There’s no telling how many lives Mickey Clark has touched with his voice, his songs, his stories and sense of humor. I knew on the first day we met that he would he would have a profound influence on me. He always put others first. I can honestly say that because of Mickey Clark, I am a better man today. In the short 8 years that my wife and I got to know him, playing music out on our patio, he made a lasting impression. It felt like we’d known each other for our entire lives. Our hearts go out to Mickey’s wife, Sandy, his son, Brennan and the rest of his friends and family. We’re all going to miss you, Mickey. So until we meet again, thanks for enriching our lives. It’s been an honor and a privilege to know you. We’ll keep the memories and love alive through your songs.